Stephen McManus's last-gasp winner against Liechtenstein saved Scotland from one of the most embarrassing results in their football history. Mario Frick's sublime curling finish from 16 yards had stunned Hampden. It took the Scots 57 minutes to force a save, with Darren Fletcher's long-ranger being parried over the crossbar. But Kenny Miller powered a drive in off the underside of the bar six minutes later and McManus headed in from 10 yards from Barry Robson's corner. 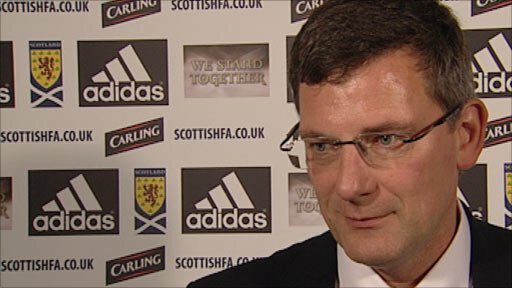 A draw at home to a side ranked 141st in the world - 100 places behind the Scots and beaten 4-0 at home by Spain on Friday - and Craig Levein's side could, arguably, have waved goodbye to their Euro 2012 qualification hopes after just two games. But, following their opening 0-0 draw in Lithuania, who went on to surprise Czech Republic on Tuesday, Scotland now top Group I. How six minutes of stoppage time can change fortunes. Levein had warned that Liechtenstein could not be underestimated, but the addition of both Kris Boyd - making his first start in three years - and James McFadden ensured an attacking formation from which the coach was expecting goals. The Scotland fans interviewed before kick-off were certainly predicting a record-breaking score to celebrate captain Fletcher entering the record books by winning his 50th cap. However, those thoughts were quickly dispelled as it took 14 minutes before Scotland seriously threatened goalkeeper Peter Jehle - and that came from a set piece. McFadden's cross found the head of Lee McCulloch, but the Rangers midfielder's effort flew over from 12 yards. Both Boyd and Liechtenstein captain Frick were unfairly penalised for offside when through on goal before the Scotland striker headed wide from close range under pressure from his marker. Scotland were becoming more frustrated, with McFadden in particular proving wasteful and, when Scott Brown and Miller crashed into one another going for a long ball, that summed up a miserable first half for the Scots. Liechtenstein were growing in confidence and a lovely flowing break ended with a low, 20-yard drive from Sandro Wieser that the Scots were relieved to see fly straight into the arms of goalkeeper Allan McGregor. There was little surprise when McFadden was withdrawn during the interval, with James Morrison being sent on in the Birmingham forward's place. Before Scotland could settle into their new formation, they found themselves a goal behind. Frick, celebrating his 36th birthday, picked up a cross into the penalty box, jockeyed with McManus and curled a beautiful shot into the corner of the net. Scotland lost Lee Wallace, who had come into the side after recovering from injury, after the left-back took a knock, with Robson his replacement. The Middlesbrough winger immediately had claims for a penalty turned down as he rose to head inside the penalty box and was clattered by the palm of Jehle. The goalkeeper used his hand to more conventional good effect moments later to divert a Fletcher drive over the crossbar. Scotland were becoming desperate, but they were level after 63 minutes when a Robson cross was headed into the path of Miller and the Rangers striker drove the ball home from 15 yards off the inside of the crossbar. David Hasler sent in a dangerous drive straight at McGregor, but the Scots cranked up the pressure against a side who were now resorting to some heavy challenges. It looked like Levein's first competitive home fixture as coach would end in another blow to Scotland's football reputation until McManus rose above the defence to send Hampden into a torrent of joy tinged with relief. Scotland: McGregor, Hutton, Weir, McManus, Wallace (Robson 54), Brown, Darren Fletcher, McCulloch, McFadden (Morrison 46), Miller, Boyd (Naismith 66). Subs Not Used: Gilks, Adam, Berra, Hartley. Booked: Robson, McCulloch, McGregor, Hutton. Goals: Miller 63, McManus 90. Liechtenstein: Jehle, Oehri, Martin Stocklasa, Michael Stocklasa, Rechsteiner, Polverino, Wieser (Ronny Buchel 71), Erne, Frick (D'Elia 78), Burgmeier, David Hasler (Nicolas Hasler 90). Subs Not Used: Bicer, Eberle, Hanselmann, Vogt. Booked: Burgmeier, Wieser, Martin Stocklasa, Frick, Rechsteiner, Polverino, D'Elia.